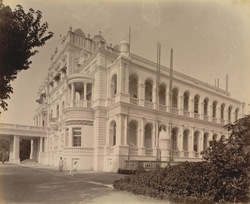 Photograph of the Nazar Bagh Palace at Baroda, Gujarat from the Curzon Collection, taken by an unknown photographer during the 1890s. The palace was originally built in 1721 and was subsequently altered in the late 19th century by the Gaekwar Maharaja Malhar Rao (ruled 1870-75). It is a white stucco three-storey building designed in the Corinthian style and set in pleasure gardens. This is a general view of the palace.